Worms with a twist. You may know them as corkscrew worms, snelled worms, molded worms, twisty worms or just plain, wacky worms. All of these nicknames refer to just one basic worm, the pre-rig worm. What makes these pre-rig worms unique is that they are designed and molded in such a way as to make them spin or corkscrew in the water when they are retrieved. They have their own unique fish catching action right out of the package, which you may or may not have seen before. The worms are generally used for Bass but can and will catch all species of fish, including Walleye, Northern Pike, White bass, Crappie and many others. Now let’s dive deeper into the world of a worm, that is so easy to fish, catches big fish, and will make a weekend angler seem like a “Pro”, that you will wonder why you haven’t tried using them before. Pre-rig worms are designed to spin or corkscrew in the water as mentioned before, but you might be asking yourself “what makes them spin by just retrieving them in the water”? Well the worms are molded in such a way as to have a kink or about an 80-degree bend in the upper portion in the worm closest to the pre tied loop. This bend or kink in the worm allows it to corkscrew in the water by just reeling it in slow. They come with 3 pre-tied hooks embedded in them. One hook is in the front, one in the middle, and one in the tail of the worm, which are all tied together. The line is usually 8, 10, or 12-pound test. Out of the nose of the worm, is the remaining line, which is usually 3-5 inches in length, which is then tied into a loop, to be used for a snap swivel so that it spins freely on the line. 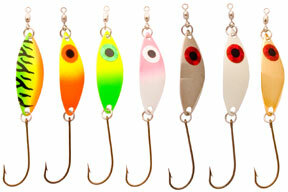 The hooks generally are between sizes 4 and 8 and come in weedless and non-weed less styles. These worms come in many, many different colors and a few sizes. 4 inch, 6 inch, 8 inch, and a big 11-inch size are the ones most commonly made. The most common ones that are used are the 6-inch and 8 inch sizes. Most of these worms also come with a scent molded right into the worm. Raspberry, black licorice, and Anise, are the main scents that are used. These scents give the worm an irresistible, fish catching ability that no fish can refuse. There are quite a few manufacturers of Pre-rigged worms, some of the most well known ones are Willy’s Worm from Innovative Sports Group (ISG), Bill’s Scented Lures, Ike-Con and Little Action Mac. Now that you know how the worm is made, let’s now take a look at how we rig it for different fishing situations. Rigging the pre-rigged worm is actually very simple. All you really need, is a high quality, ball bearing snap swivel and a few split shot sinkers for added weight, especially on days that are windy. I prefer a spinning rod with 6-8lb. Berkley Trilene XT green line, and a good quality ball bearing snap swivel, black in color to deter any fish seeing it, with a duo lock or snap lock and in sizes 1, 2, or 3. Use a high quality ball bearing swivel because the worm is made to twist and spin through the water and will kink up your line if one is not used. Some manufacturers that make high quality ball bearing swivels that I recommend are Sampo, Spro, Cabela’s and Berkley. All you need to do is open the snap swivel and place the loop end of line of the worm into it. Then close the swivel and you are now ready to fish! One of the most well known places to use these worms is under docks, piers, and boathouses. Skipping these worms under this type of structure makes for an exciting way to fish. Here is an inside tip on how I personally fish it. What I generally like to do is have the swivel of the worm about 3 inches from the tip of my fishing rod, this enables me more control of the rig when I try to skip it under the pier or dock. I get as close as I can to the structure without spooking any fish, crouch down low and sidearm cast the worm under it. This may take several attempts to get it under the pier or dock, but once you do, hold on, because if there are fish underneath it, 9 times out of 10 they will smack it willingly and there will be no question about it. Now, let’s take a look how we can put these worms to good use on weed lines and weed beds. It’s a no-brainer that fish use weed beds and weed lines as cover, to ambush their prey from. So what’s a better way to use the pre-rigged worm, than to use them on the structure that fish relate to most of the time? Weed beds provide cover, oxygen and most importantly, food for predator fish. A high percentage way to boat more fish with these pre-rig worms is to fish the deeper, inside, and shallower weed lines and edges. A good way to start fishing it is to cast out the rig and let it settle down to the bottom. Be sure to watch your line as it is settling, to make sure a fish hasn’t inhaled it on the way down towards the bottom. As the worm lies on the bottom, give the rod tip a quick “snap” and start reeling the rig back in. More times than not, you will have a strike at the initial first “snap” and start of the retrieve. I try to work the weed lines and edges first, then work my way into the weed bed itself. This enables me to precisely work the high percentage inside turns, points, and irregularities of the weed lines and edges first, without spooking any fish that may be in there. I will also fish parallel with the weed lines, so that the worm stays in the strike zone longer, thereby increasing my chances of hooking into a fish. Fishing in wooded cover, can be a fisherman’s worst nightmare. There aren’t many lures that will enable a fisherman to get into those hard to reach snaggy places. Hooks on most lures, tend to snag deep into the wood, thus making it virtually impossible to get down into those areas where fish relate to for cover. The weed less variety (Shown at right) of Pre-Rigs are a godsend for those hard to reach places. On each of the 3 hooks on the pre-rig, there are small thin wire guards, that guard and protect the points and barbs of the hooks, so that it can be fished easily in those hard to reach places without snagging. Just fish it as you would a normal weedbed cast it out, retrieve, and hang on to your rod! 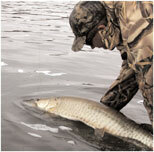 Reading the above article will teach you how to fish with pre-rigged worms right out of the package. But if you want to add even more fish to your bag, use these advanced, tried and true tips that will make you an even better angler out on the water. In the beginning of the article I mentioned that you should use a black ball bearing swivel, well that’s a good baseline to start out with, but on days that the sun is high and bright, you can actually catch more fish by using a chrome ball bearing swivel, which will enable more “flash” to the presentation and will attract more fish to it, thereby increasing the actual percentage of fish to your pre-rig worm. When the sun is high and bright, the colors of clear metal flake, purple metal flake, blue metal flake, green metal flake, and red, white, and blue metal flake will increase your bag limits, because of the extra sparkle in the water as the worm is retrieved. It really throws off the shine when it is twisting through the water! When fishing on weed beds and weed lines you will increase your catch by finding the small indentations or pockets, if you will, in the weed line. Fish tend to hold tight on these spots and are a gold mine, if you can locate them without spooking the fish that may be there, before getting a chance to fish it. If the normal cast and retrieve system doesn’t seem to be working for some reason, whether it be a cold front, dirty water, or the fish are just “off”, instead, try quickly jerking the rod tip as you work it back in. Kind of like a jerkbait retrieve, but with smaller, tighter pulls of the rod tip. This makes the action of the worm very erratic and may turn on those harder to please fish. These pre-rigged worms can also be used slow trolling for Walleyes. Just add a 1-2 ounce snap weight about 5-8 feet in front of the swivel and slow troll along points, rock bars and mud flats as you would a crankbait or spoon. Now that you know what the Pre-rigged worm is, how to successfully fish it, and some key areas to look for when trying to find some fish, you can apply all of this knowledge out on the water and hopefully increase your catch of fish. Best of luck and please practice C.P.R of the bigger female “spawner” fish. For many of you the fishing and boating season has come to a close. Many of us are waiting for that” Indian Summer” weather, for a few warm days on the water before we finally decide to put the rig away. When you make that final decision, there are some things that you need to do so you can avoid problems in the spring. If you follow this general guideline, I think you’ll be on your way to good start come springtime. I’ll take you through the steps I take. And I hope you will follow them as well. The first thing I do is to put enough Stabil in my gas tank and then I fill up the tank. On the bottle of Stabil it will tell you how much to add so you have the correct mixture. I then head for home and put the garden hose into the flush out port and turn on the water, and start the engine. If your engine is not newer, you will need to get a pair of EARS to use to flush out your engine and supplies water to your engine while running it. You can purchase these ears at any marine dealer such as Heckels, or Amherst Marine, they both have websites and will answer any questions you may have as well. I run the engine long enough to get the Stabil into the fuel system, and injectors and or the carburetors if that is what you have. I usually run mine 3-5 minutes. While your doing this, if you have a carburetor engine you need to FOG your engine at this time, as it will save you some time by doing it now. In your owners manual it will tell you what to do and how long to do it. I won’t try to tell you how I do mine, as it may not pertain to your engine so it is best to look in your owner’s manual for instructions. The new Technology motors require you to go to your dealer to have this done correctly, and you have a huge investment in your motor, so take it to them to have it done right. After that is done, I check all the fuel lines and clamps for any signs of wear and to make sure there are no fuel leaks of any kind. I also check and clean the fuel filter and water separator. I also spray WD-40 on anything under the engine cover that my corrode. I also put a small amount of grease on the flywheel teeth and on the hinge cover latch. I then will pull the spark plugs and check and clean them and if need be, install new ones. While the spark plugs are out, I spray WD40 into the cylinders, and reinstall the spark plugs. I also look at the linkages, and cables, and grease them if they need it. Next I will drain the lower unit in an oil pan by taking out the bottom plug first, then the top plug and let it drain until it stops. I check for the presence of any water in the oil, as this will tell me if I have a bad seal or gasket in the lower unit. When it is time to refill the lower unit, I use a pump, it just screws right into your lower unit, and works much better than trying to hold the oil bottle tight, and squeezing the oil out and having it run all over the place. You will know it is full when the oil starts to run out the top hole. When this happens put the top plug in and remove the pump hose, and screw in the plug for the lower unit. Wipe off any oil on the lower unit. Next I will grease any fittings on the motor, and wipe off excess grease. I check the fluid level in the power trim and tilt unit. If it is low, add to the fill line. I also take the prop off, check the splines, and put a light coating of grease on the spline before putting the prop back on. Make sure you check your prop for nicks and cracks. If it needs fixing now is the time to get it done. If you find you need a prop, I want to suggest a Comprop. If you have never tried one or heard of one then you need to contact me, or check out there web site, as this is the only prop I will run. Its added protection for my lower unit. You’ll be amazed at the Boat Manufactures that put this prop on as OEM. Next check mounting bolts, and any of your electronic cables such as your locators and speed/temp cables to make sure they are connected securely to the boat. I will also take out the drain plug and clean any water intake filters for the live wells, and reinstall. Make sure you blow out your live well drains, and bilge pump line, as water left in a line can freeze and you will have a real problem come fishing season. Next I will pull the wheel bearings, and the seals from the hubs. Before you reinstall the bearings, put in new seals in the hubs, don’t reuse the seals your just asking for trouble, and seals are not expensive. Next I will clean the bearings with a recommended solvent NEVER USE GASOLINE FOR A CLEANING SOLVENT! And dry them off and inspect them for wear. I also look at the spindles to check for wear and pitting. If pitting has started, you can use emery cloth to take out the pits and smooth the surface. If I see any amount of wear I replace the bearings and the races at the same time. Never put new bearings in and use the old races. Next I repack the bearings. I bought a bearing packer a long time ago at an auto supply store, and I don’t miss the mess of hand packing them. Adjust the bearings as to the manufactures specs. And reinstall your bearing buddies if you use them. If you don’t have them I suggest you get some, as this is the best way to put grease in your hub for bearing protection and to keep the water out. Make sure you don’t over fill the hubs with grease as the hubs will run hot, you don’t want that, and you don’t want to pop the rear bearing seal either. Just fill it until the spring-loaded surface comes to the front of the hub and a small amount of grease comes out. After you use your rig next spring, check your hubs again as I’m sure you will need to add some more grease. Next check your winch rope or strap to make sure it is in good shape. Put a small amount of grease on the gear teeth, don’t gob it on; just a small amount is all that is needed. Put a small amount of grease on the tongue hitch mount as well. Check your rollers if you have them and make sure they are all in good condition. If you find a crack in one replace it! Okay, so the lubrication part is over with. Lower the motor to the run position for storage this will drain out any water left in it. Next I wash and wax the boat and trailer. I recommend a Marine wax, as it is designed to give you more protection than an auto type car wax can. I vacuum out the inside of the boat, including the live well, and I leave the live well covers open, and I Clean the windshield with warm soap and water. I then use this product from” Innovative Polishing Systems”. This stuff removes all the scratches from your polycarbonate windshield. I do mean” ALL” the scratches! It works on regular glass as well; it is a product you really need to get, as it is so versatile, just go to ipsglass.com, and order this product. If you’re like me you have tried to get those scratches out, and this product will do just that. It works great on jell-coat as well. Check it out! I also store the windshield in an old flannel sheet; this keeps it in great shape for the spring. I also use a vinyl cleaner on my seats and dash, and I remove the locators and store them in a dry place. I also wipe down my trolling motors with WD40 and make sure they are unplugged. I check all my antennas and either fold them down or push them down and out of the way. This pretty much takes care of the inside except for the batteries. Next I remove the batteries. If you have not done so yet, get some cable ties and make your wiring neat and out of the way. If you have not labeled them yet I would do so before you remove them so you know where the wires go. You don’t want to wait until spring and try to figure out what wire goes where. Do it now and save some fuses. On the topic of batteries, there are some important things to talk about. New batteries are very expensive, and you want to take care of them. I used to replace my batteries every year and if I was lucky I might have gotten 2 yrs. Out of them. This was very costly, to me. One day while guiding, a client told me about a product called Thermoil. Well I got to tell you, I was skeptical about putting anything in my batteries. Over the years I have spent some money on products billed as the real thing for improving battery life. Well, I got to tell you this stuff really works. My client knew what he was talking about. This product is called Thermoil and you can go to their website and look them up if you don’t have a dealer in your area. It REALLY does work and now I can get 4 years out of my batteries, and that saves me money, and I like that. It is money well invested believe me, plus it is” Guaranteed or your money back.” We have the batteries out and charged so where do I store them? The old myth that you can’t put them on a concrete floor is just that! A MYTH! The new type batteries can be placed anywhere they’re not subject to high temperatures or freezing. I have found out that you do not need to have a trickle charger on them either. If you check and charge them once every other month this is enough charging, and I know this to be true. You want to make sure your battery posts are clean and put a light coat of dielectric grease on them. I mark a day on my calendar to charge the batteries, and that is the only time I will charge them. So now we are ready to put the cover on the boat, but before you do this I recommend that you go to your boat dealer and get what is called mold and mildew bags, and put them in your boat. This will solve your problem of smell and extra cleaning in the spring. Make sure your cover is not torn and in good shape and that it has a snug fit .If you store it outdoors, I suggest you find a dealer that will shrink wrap it, I know Heckels Marine does this, and it is worth the cost to have it done if it stays outside. Well that covers your winterizing! Now it’s a waiting game counting the days until the ice goes out. If you have any questions on anything in this article you can e-mail me at either RiverRat@Fish-Wisconsin.com or River_Rat_54494@yahoo.com . If you have any questions or would like to talk to me in person please contact me. When people think of a trophy Largemouth Bass, they pretty much assume that it should be in the magic “10 pound and above club”. When you hear of someone catching that 10 pound trophy, you have a vision of what lake that fish may have come from. Southern state lakes always seem to jump in your mind first. Lake Castaic, Okeechobee, Pickwick, Lanier, Table Rock, Dale Hollow, and the hundreds of others that I don’t have space to mention here, but you get the idea are the ones people think of first. bass fishing around. The Menomonee, Peshtigo, Wisconsin, Fox, Wolf, Black, and the Mighty Mississippi are a few of the best rivers to bag a trophy 6 pound bass. Now that you have a list of lakes that have the potential for a trophy bass, here are some of the key structure areas to look for when fishing those lakes. Keep in mind that bass have specific travel routes that they use throughout the day. Bass also tend to feed at specific times of the day, but that can change with changing weather patterns, cold fronts, water clarity, fishing pressure, food availability, and so on. So keep that in mind when pursuing them. Submergent weedbeds go without saying. They hold more bass than any other type of structure. Hands down! Bass will either be cruising along, through, or sitting tight to submergent weedbeds. Weeds offer shade, food, and safety for the bass. They feel safe and secure when they are in the weeds. Up here in Wisconsin, unlike in the South, the number one predators of bass are Northern Pike and Musky. So a bass has to have that “cushion” of security feeling all of the time. 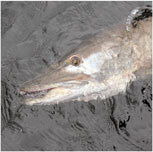 Northern Pike and Musky are opportunistic feeders, which means they feed at any given moment, at any time of the day, and will try to eat fish that are as big as themselves. Bass have to always be on the lookout for predators. The key types of submergent weeds and weedbeds to look for in Wisconsin’s lakes are those containing Coontail, Cabbage, Eurasian Milfoil, Lily pads, and Wild Rice. The most active Bass will hold on the edges of these weedbeds and are the most easy to entice into striking. A good “search” technique for the weededges, is to run a spinnerbait or a crankbait parallel with the weedbed. If there are any active bass on that particular weededge, they should smack your lure without thinking twice about it. is pretty simple. You cast out the jig and let it settle down into the weeds, close your bail on your reel. Next reel in all of the slack so your line is tight, and then you “pop” up or “snap up” your rod tip which “jumps” the jig out of the weeds. Reel in any slack and let it settle back down in the weeds on a tight line. Repeat the process until you get a fish on, or it comes next to the boat ready for a new cast. Bass can hardly resist this technique and many times will strike the jig on the first “pop” that you make. Another hot technique in Wisconsin is to use a modified Carolina rig. Instead of using an egg sinker which slides on the line in a Carolina Rig, just pinch on a large split shot or two, 12-20 inches above your hook and fish it faster than a Carolina Rig. The choice of baits stays the same. The way you fish this rig is to cast it out and close the bail. Start reeling before you think it will get into the weeds. Just reel it in slow and give it a “pop” or “snap” every few reel turns. Don’t let the sinker settle into the weeds or you will get hung up. This is a great way to catch bass that are schooled up tight to the weeds. Try these new techniques next time you are out and I am sure you will boat more bass. productive way to find the more aggressive bass. While slow rolling a 1/2 oz. spinnerbait will entice the less aggressive bass on the deeper edges. Let’s take a look at another type of structure that bass use commonly. Docks and Piers. A lot of people don’t think of docks and piers as structure, but they are. Docks and piers hold bass for the same reasons weeds and rocks do. For safety. And also to get out of the sun. It’s cooler under docks and piers. 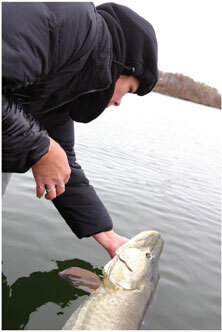 Bass prefer cooler water especially when the water temps climb into the high 80 degree marks. Bass will sit tight to docks and piers and wait for prey to swim by. The bass will ambush them and get an easy meal. best way to fish these pre-rigs is to skip them under the docks and piers. The farther back you can skip them, the better. Let it settle to the bottom, and then start reeling it in slowly. That’s all there is to it. The actual hard part is learning how to skip them under the docks and piers. The best way is to have the worm almost touch your rod tip, and then crouch down low on your boat to make it easier to side cast it under there. Practice makes perfect. Vegetation is another key area to keep in mind when looking for bass. Lily pads, cattails, moss, and even Algae blooms are types of emergent vegetation. These topwater weeds provide cover and shade for the bass. Lily pads are a good example of providing shade and cover for bass. Lily pads are fun to fish, in that any time you have an opportunity to have a bass crash a surface bait is really exciting, and gets your heart pumping. Plastic rats, plastic frogs, Moss Boss’s, Mister Twister’s Prop Top, and other topwater lures work very well in emergent vegetation. Big bass will sometimes be in the middle of the weed piles or just on the edges of them. Hopping a rubber frog from lily pad to lily pad is a great way to entice bass into striking. Algae blooms can be very difficult to fish because the algae clings to your line and lure, which can make the lure run untrue. After every cast it is a good idea to clean off the lure. But don’t let that stop you from fishing during an algae bloom, some of my biggest bass have been caught during an algae bloom. effort. Use heavier line and try to get the fish out of there as quick as you can, so that they don’t have a lot of time to tangle you up in there. pound bass are out there, but are a very exclusive limited resource. A 6 pound trophy bass, in Wisconsin, is a more attainable goal, and is looked upon by fisherman as a true Midwest trophy. Try some of these techniques, and I’m sure the odds will increase in your favor of catching a 6 pound trophy bass. I wish I knew how many hours I’ve spent on the water trying to figure out how I was going to get the walleyes to bite. I’m sure that you’ve all been fishing at one time or another and you were having one of those very slow days that everyone dreads. There are lots of things that can be tried on a day like that but you have to decide if you’re going to make a drastic change or some kind of subtle change to try to get rid of the walleye lockjaw. Many times it may take something really simple to trigger a bite and sometimes you have to drop a rock on them to get any kind of response at all. Lets take a look at some different fishing methods that you could try in order to improve your chances at catching some fish. Most of the time it doesn’t take a rock but just a grain of sand to get a walleyes attention. There are many subtle changes that can be made to something as simple as a Lindy or Roach rig when fishing for walleyes and I’m going to give you some examples of changes that may work for you. If the fish aren’t responding to a plain rig, the first and easiest thing that I usually do to make a change is to add a colored bead above the hook or just change the color if there is already a bead there. My next step is usually to change the hook to a colored one and then of course I experiment with the color if I have to. This can be expanded even more by using a bead that contrasts to the colored hook or by using no bead at all. There are colored sinkers on the market that can be added but to be real honest I have never noticed any difference whether using a colored sinker or a plain one. Another real subtle change that a lot of people don’t really think about is to change your leader to fluorocarbon to really help your finesse approach. My personal choice is Berkley Vanish but there are others on the market that may be your preference and this small change can sometimes be the key to catching fish during a tough bite situation. You can see that there are lots of easy and inexpensive things that can be done to something as simple as a rig. If we expand these simple ideas to a jig, we can add a colored bead ahead of the jig, add a tail, add a small piece of plastic from a tail to hold your live bait on the hook, change colors of the jig, the tail or any of the parts and the list goes on and on. Jigs are by far the easiest things to make changes to whether it be color, size, or the type of jig, all of the changes can be done usually by tying on a new jig or just changing the tail or the tail color. Now lets take a look at what we could do to make some subtle changes to a crankbait that hopefully will help to trigger otherwise dormant walleyes into striking. I’ve looked into some guys tackle boxes and all of their lures have the lip or the head painted red. Obviously this might work some of the time but now they’ve lost their chance to change. If you talk nice to your wife she may give you an old bottle of red fingernail polish (or some other color if you prefer) that you can carry in your tackle box. It only takes seconds to get the bottle out and change some of your lures to a red head, red belly, a red lip or sometimes just a red dot where the gill would be is just enough to make a difference. Another trick is to have some colored treble hooks in your box (or make them using the fingernail polish) and change the front or rear hook to a colored hook to help give an even different look to your bait. These are just a few ideas that are small changes but can sometimes make a difference between having a great day fishing or just catching a few fish. Remember a grain of sand is a subtle change that might trigger the fish to bite. If you drop a rock you might scare the fish away or it may be the change needed to trigger them into biting. What I call a rock is any time I change from one type of fishing to an altogether different way. For instance if I’m jigging or rigging and I change to casting a crankbait or trolling, this is what I would call dropping a rock. You’re not doing anything subtle but you’re making a drastic change by using an altogether different method by changing both your lure and your presentation. There have been many times when the rock has been the answer to winning a tournament for me. To be successful you have to be able to convince yourself that change is the answer and then do it. Many of the small changes that I mentioned earlier can also be used to change the look of the lure after you’ve changed your presentation method. Color changes as well as adding or taking away color on your lures are one of the easiest ways to alter your presentation. Whether you’re using crankbaits or live bait rigs and whether you’re casting or trolling you can use many of the subtle changes that I mentioned earlier to alter the color or action of your bait. Very often, people get in a rut and will only use their favorite bait and color because that’s the one that they’re comfortable with and have the most confidence in. It’s a great thing to have confidence in your bait but the thing that you must keep in mind is that there are many very simple ways to make changes to your baits that may mean the difference between catching fish and being skunked. Sometimes it may take only a grain of sand to get the fish to bite and sometimes it may take a rock. But many times change is good. Have you ever used a WilloSpoon? If you ever ask someone that question I’m sure they’ll say “sure I used them a lot through the ice and they work good.” Hardly anyone will say they ever used them in the summer and if they have they only used them to vertical jig for perch or some other pan-fish. I’m going to tell you some of the ways that I use the WilloSpoons and how you too can use them to put more walleyes and other fish in the pan all year long. My first experience using a WilloSpoon was one winter many years ago while fishing for Perch through the ice on lake Mille Lacs. I was busy catching Perch when all of a sudden I had a much bigger fish on the line and after a few minutes playing it I landed a Walleye that was over 8 pounds. After catching a few more smaller Walleyes the rest of the day I got to thinking that there might be something to these little spoons and maybe I should put some info in my notes for summer fishing and give them a try at that time. Being a Walleye tournament fisherman I always keep notes on things that happen when I catch Walleyes and I put that information in my computer to use later. It isn’t a bad idea for everyone to do something like this to keep track of their fishing success or lack of success whatever the case may be. In fact there are computer programs that you can buy for just this purpose. When the next tournament season started I printed out all of my notes and as I was reading them the WilloSpoon notes popped up. It didn’t take long for me to start to think about how I could use them during tournaments. I decided to pick up a few more WilloSpoons to try if the conditions were right. The conditions are usually right if I’m not catching fish on anything else. As you might expect I didn’t even think about using them until a while later while prefishing and as usual I wasn’t catching any fish so I decided to try them behind a bottom bouncer for a while just for something different to do. As you might guess, nothing happened, but a while later when I was talking to a tournament fishing friend he told me about catching some Walleyes while casting WilloSpoons in shallow water. Now I just had to try them more often and I had to see for myself if there was really anything to these things. They have a lot of things going for them if you really think about it. They come in a multitude of colors, they’re almost weightless and you can push them inside of a tube tail to make them a soft body. You can bait them with any kind of live bait as long as its small and if you don’t like the hook you can replace it with a treble or a colored hook or as you will read later in this article, there are secret special ways to use them with no hook at all and still catch fish.??? Now that I had all this good information it was time to try them and see how I could use them to catch fish. The first thing that I did was try casting them. I’ll tell you something, you soon find out that you have to use very light line and only cast down wind or you end up with them landing right in front of you in the water or if your not careful stuck in your forehead. I tried adding a small split shot a foot above the spoon and I changed the single hook to a #8 or 10 treble hook. Next I tried using a small minnow or leech , as you can see I was really grasping at straws to try to get these things heavy enough to cast. Several of these things seemed to help quite a bit and gave enough weight to cast and didn’t really bother the action any. I used this rig in some real shallow water when prefishing for a tournament on the Mississippi river and caught a fish in the 7 pound range as well as some smaller Sauger. This is definitely a shallow water rig because of the light weight although I would think you could try a heavier split shot for deeper water. When using the WilloSpoon in deep water I found that dressing them with a small minnow or half a crawler and trolling them very slowly behind a bottom bouncer or snap weight was the most affective way next to vertical jigging. That is if you want to catch the fish on the WilloSpoon. If you want to use them as flashers to help catch fish with another lure here is another one of my brainstorm ideas that paid off and you might want to try. Take the hooks off about three WilloSpoons and replace them with small swivels. Now tie the WilloSpoons in line about 6 inches apart and about 2 feet ahead of a crankbait when trolling, you might be pleasantly surprised at the flash they produce and how they resemble baitfish swimming along. Of course you can use any number or color of WilloSpoon that you want or modify them any way that works for you. Probably the way that WilloSpoons are most used is ice fishing. I must admit this was the only time that I used them for a lot of years. I still use them any time I go ice fishing for any kind of fish except Northern Pike. Not that they don’t work for Northerns but their sharp teeth will cut the line and you will loose lots of baits. When fishing in deep water I use about an 8 inch pencil sinker 6 or 7 inches above the WilloSpoon. By using this rig you will not tangle the WilloSpoon on the line like you will if you use split shot when lowering it into deep water. For shallow water applications you normally wont need any weight so the tangle problem is eliminated. There are many ways to dress the WilloSpoon with live bait. You can put ice fishing grubs on it, the head of a minnow or what I like is the tail end of the minnow. I remove the head of the minnow right behind the gills and then hook the body so the tail of the minnow is hanging and just kind of floating in the water when you jig it up and down. This is dynamite on Perch and Walleye through the ice and would probably work equally as well in the summer. As you can see the WilloSpoon can be used throughout the year with good success. Of course the original Walleye WilloSpoon from Bait Rigs tackle will always provide the best results and the “fire” colors that are new this year are a great addition to the WilloSpoon line, it gives you more selection and makes them even more versatile. I’m really looking foreword to the coming tournament season when I’m sure that I’ll be using the WilloSpoon even more than I have in the past. Try em I think you’ll learn to like em too. If you’re having trouble finding the WilloSpoons at your local sport shop, you can order them online from E-Bait.com in the Bait Rigs Tackle Store. It will be well worth your while. Walleye Willospoons are available in 2 sizes, Panfish Willospoons are recommended for Perch fishing. During this past winter, I visited with a lot of anglers on a wide variety of fishing topics. Sometimes these conversations concerned information that we already knew about fishing, while other times we explored new ideas and concepts that still needed proving. The one fact that I did learn was this. There are far too many anglers that have not yet learned the importance of spinning blades for walleyes. My first experience with spinners took place when I was back in my youth. We would troll stretches of Lake Pepin, a widening of the Mississippi River, with spinners in search of walleyes. We found that the dirtier the water was, the better the spinners worked. Believe me, in those days, Lake Pepin was really dirty! Years later, when my family would travel around on camping trips, we again put spinners to use. It didn’t seem to matter much just where we fished, a live bait and spinner rig combination would always produce something. However, it wasn’t until about ten years ago that I really started to get into spinner combos as an excellent system for picking up walleyes. It started on a hot day on Mille Lacs Lake, a walleye factory located in Central Minnesota. On this particular day, we found absolutely no active fish on the big flats that dot the middle of this lake. It wasn’t that fish weren’t there, they just wouldn’t hit a conventional live bait rig. Eventually, my fishing partner pulled out a couple of bottom bouncers and said we were going to experiment with spinners. About this time, I was game for anything and readily followed his lead. and spinner combos were rigged and baited with crawlers, we started our trolling presentation. At first I was certain we were moving way to fast to trigger these lethargic walleyes, and then my partner hooked the first fish of the day. It wasn’t long before we had caught a fair number of really nice eyes. It also wasn’t long before our activity had attracted several other boats. I am sure they thought we were crazy trolling around for walleyes at breakneck speed, but we didn’t mind a bit. We were sticking lip and that was all that mattered to us. Over the years I have gone to this bottom bouncer and spinner combination again and again and have really come to believe in it. One innovation that has made spinner blade fishing even better is the invention of the Hatchet Harness. Last summer, on a Canadian trip, we hit a stretch of tough weather. The front that came through really shut down the walleyes we had going. The fish had not changed location, they just refused to touch a jig. When I pulled out a couple of bait casting rods and started rigging up spinner rigs, the guy I was with thought I was crazy. When I tied on a big bladed Hatchet Harness, he was sure I was crazy. He couldn’t believe that strange looking blade could attract fish. He soon changed his mind. He hadn’t finished threading on his crawler before I had a fish. Not only was it the first fish of the day, it was the biggest fish of the trip up to that point. He became a believer in a big hurry. We fished this rock reef until our crawlers were gone and then switched over to Power worms. Although they didn’t produced as good as live bait, we still continued to catch our share of fish. The Power worms were tougher and you didn’t have to worry about checking your bait on a missed strike. Spinner rigs aren’t my first option for walleyes, but they can be a good second choice. They seem to work best when you have scattered, lethargic fish. Walleyes are attracted to the thumping of the blade and the speed at which it moves. 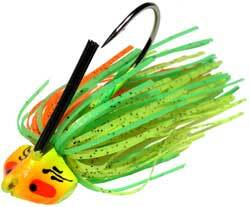 Fish that are sniffing at slow moving bait will react to this fast moving spinner and hit it before it gets away. The speed doesn’t allow them time to think about it, they just react. I have found crawlers to be the best bait for bottom bouncers and spinners. Leeches and minnows often twist when trolled at high speeds. 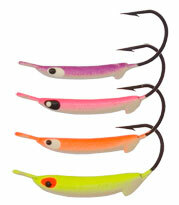 Besides, by the time walleyes hit the lethargic summer period, crawlers are a great option anyway. Walleye anglers need to take note of this style of fishing. It is easy and extremely effective. The biggest challenge most walleye anglers face is coming to believe that spinning blades really does trigger fish. Once you learn how well it works it will become a permanent part of your walleye strategy. Copyright © 2000 by Jeff Snyder. All rights reserved.